Cleaning a home deeply should be done once a year and spring is a great time to dig in and actually do it! 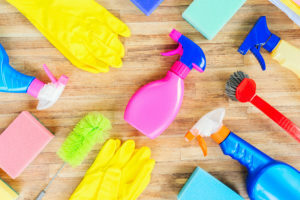 Instead of focusing on a long list of things to accomplish, we’d thought we’d share five things to keep in mind when it comes to spring cleaning your home. This is an easy reminder when it comes to cleaning out your house and it can apply to any room. For clothing items, ask yourself if you have worn it in the last year. If the answer is no, look to donate it. You can help others in need this way and that always feels great. Seek out charities that support your community. For many people, creating a to-do list feels productive and how good does it feel once you can officially check if off? Follow our suggestion by breaking up your cleaning into sections and making a list of what you want to accomplish in each room. Get your family or other household members involved, assign them specific tasks, turn on some good music then celebrate with a night out together. Don’t feel like you have to clean all day long to feel like you’ve been productive. Marking several items off your list can simply do the trick! Looking for a Basic Spring Cleaning Checklist? Start here. Dust all furniture, picture frames, television, or hanging décor on walls. Dust or wipe down baseboards, blinds, window sills, vents. Disinfect items like your TV remote, door knobs, computer mouse or kitchen drawer handles. Organize each room & donate/discard what you won’t use. Disinfect your bathroom items like tub, shower and toilet. Wash shower curtains. Your home is a valuable asset so keeping it clean will not only keep it in tip-top shape, but will clear the home of allergens, bacteria and mold that can build up over time. With a little elbow grease, you’ll be done in no time. If you have questions about your insurance, call the insurance agents at Interstate Insurance in Edmonds, WA. We have years of insurance experience and can help you insure everything from your home to your auto or motorcycle. We live where you do and are an independent insurance agent, so we can help you find the right company to fit your needs. You can also check out our website, 24/7.